Let’s be honest: sometimes you have a question about your medical history and you just don’t want to schedule an appointment or call your doctor to get that question answered. Plus, in today’s active world, it makes more sense for people like you to have access to your personal health information at any time. At Genesis Medical, we understand the importance of providing our patients not just with good care, but with the resources they need to make healthy choices and lifestyle changes. And to give our patients access to both of these things, we’ve created a Patient Portal that will provide you with the information and tools you need to keep track of, and take even more control of, your health. Our Patient Portal allows our patients, like yourself, to easily and securely access their medical records online. Even better, it also provides an easy and convenient way to communicate with Genesis Medical. How does it work? Think about the online banking or credit card accounts you currently have. Now imagine a similar site for your medical records, and you have an idea about how our Patient Portal works. The tool was designed specifically to give you access to your medical records 24 hours a day, 7 days a week. And just like a banking account, only you will have access to your personal health records. Even better, our Patient Portal allows users to send and receive non-urgent messages and information between themselves and their doctor. This means things like test results and clinical visit summary reports can be delivered right to your home, via secure digital communications. Patients can also easily request a refill for their prescription medications, and you’ll be able to easily update your personal information (such as addresses, telephone numbers and more) right within the Patient Portal. The Patient Portal is more than convenient: it’s the perfect tool for people who are working towards making healthy changes in their overall lifestyle. By providing you with easy access to your medical records and doctors’ notes, as well as offering a way to connect with healthcare professionals outside of the office, we’ve created an excellent resource for patients to use in their day-to-day routine. And we admit that in addition to this tool removing the stress of playing “phone tag” with a doctor’s office from your life, it’s also a great source of pride for our own doctors. Why? Because we take great pride in our patients being active members of their healthcare, and the Patient Portal is one of the best resources we have to help make this possible. While we are in the process of developing smartphone access to our Patient Portal, at the moment you can only access this tool via a computer that has Internet access. To sign up and begin using our Patient Portal, you will need to have an email address for yourself only; due to privacy laws, each individual in your office and under our care will need to have separate email addresses to access their records. These email addresses will be treated with the same privacy as your medical records and never sold or leased. 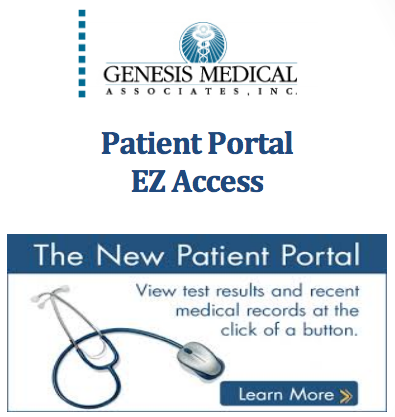 Ready to sign up for the Patient Portal tool that’s available to all of Genesis' patients? Just contact our office and ask for an invitation or provide your email address to get started. After that, you’ll be able to learn more about using and navigating through the Patient Portal by clicking here. You’re also welcome to call our offices if you experience any difficulties using this important tool.